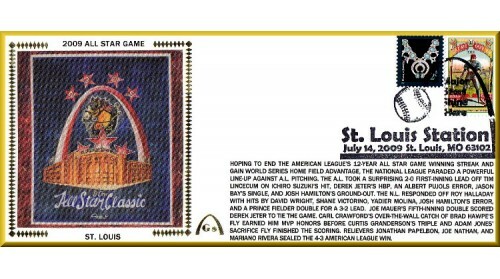 The 2009 All-Star Classic Was Played In The Beautiful New Busch Stadium With All The Grandeur Known To The Cardinals With The Beautiful Clydesdale Horses Leading The Parade. The National League Was Hoping To End The American League's 12-Year All-Star Streak With Home Field Advantage. The National League Had High Hopes With Albert Pujols, David Wright, Ryan Braun, Adrian Gonzalez, Ryan Howard, Ryan Zimmerman, Hunter Pence, Yadier Molina, Prince Fielder And More. But The American League Took A Surprising 2-0 Frist-Inning Lead Off Tim Lincecum. Joe Mauer, Mark Teixeira, Evan Longoria, Derek Jeter, Jason Bay, Kevin Youkilis, Carl Carawford, Torii Hunter And More Responded Of Roy Halladay For A 4-3 Victory With Mariano Rivera Sealed The Win. This Is A Large #10 Unautographed Envelope.